It's a bird! It's a plane! It's an Inflatable Superman!!!! Come and jump with the "Man of Steel" in one of our hottest new items. 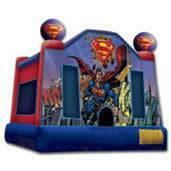 This is a great inflatable for Superman fans young and old. You will think you can take on Lex Luthor after jumping in this unit. Order now as this items rents out fast.